Home By Country Malaysia One gurpurab, two dates. Why the confusion? One gurpurab, two dates. Why the confusion? Some are celebrating Guru Gobind Singh's birthday today - 5 Jan 2016. Others will celebrate it on 16 Jan. Why the confusion? 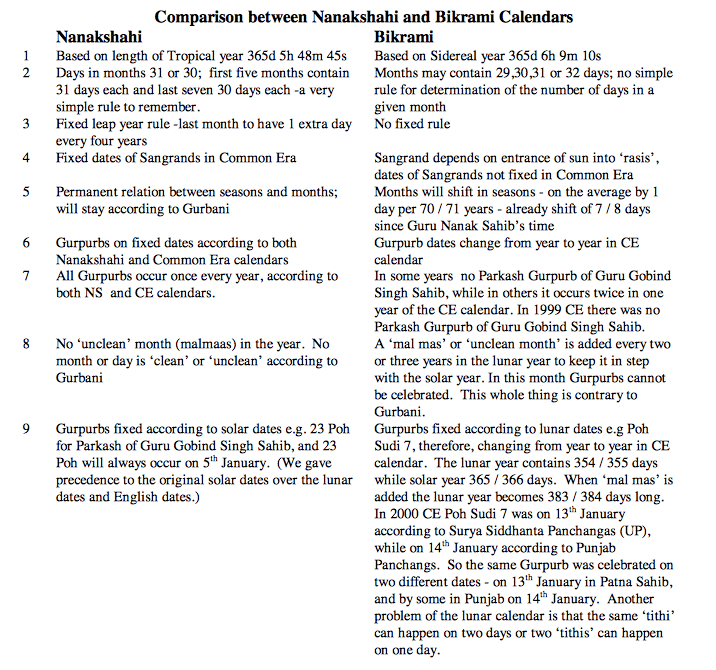 AUTAR SINGH takes a quick look at the Nanakshahi vs Bikrami calendar issue. While the majority of the Gurduaras around the world are celebrating the Parkash Purb (birthday) of Guru Gobind Singh ji today, ie on 5 Jan 2016, there are some who will be celebrating on 16 Jan.
Two different dates for one gurpurb! How is that possible? To put it simply, this is caused by the use of two different calendars by the community; the erstwhile Bikrami Calendar and the new Nanakshahi Calendar. The former being a luni-solar calendar while the latter is a solar calendar. More specifically, the Bikrami is based on Sidereal year of 365 days, 6 hours, 9 minutes and 10 seconds , while the Nanakshahi is based on the length of Tropical year of 365 days, 5 hours, 48 minutes and 45 seconds. Gurpurbs based on the Bikrami calendar keep occurring on different dates every year. The Parkash Purb of Guru Gobind Singh ji had been celebrated twice in some years and not at all in some other years. The Nanakshahi calendar has fixed the dates and Gurpurbs now come on fixed dates every year. Thus the Parkash Purb of Guru Gobind Singh ji is celebrated on 5th January every year. The Nanakshahi Calendar was approved and implemented by the SGPC in 1998. It has been acclaimed as a milestone in further establishing the sovereignty of the Sikh Faith and was approved by the Akaal Takht Sahib in 2003. However, it was later amended due to pressure from certain groups who wish to continue using the Bikrami calendar. To keep the article short, please see the table below that compares the two calendars. It is taken from an article by Sardar Pal Singh Purewal who introduced the Nanakshahi Calendar. Hope it helps to understand the reason for the different dates. N: Days in months 31 or 30; first five months contain 31 days each and last seven 30 days each -a very simple rule to remember. B: Gurpurbs fixed according to lunar dates e.g Poh Sudi 7, therefore, changing from year to year in CE calendar. The lunar year contains 354 / 355 days while solar year 365 / 366 days. When ‘mal mas’ is added the lunar year becomes 383 / 384 days long. In 2000 CE Poh Sudi 7 was on 13th January according to Surya Siddhanta Panchangas (UP), while on 14th January according to Punjab Panchangs. So the same Gurpurb was celebrated on two different dates – on 13th January in Patna Sahib, and by some in Punjab on 14th January. Another problem of the lunar calendar is that the same ‘tithi’ can happen on two days or two ‘tithis’ can happen on one day. 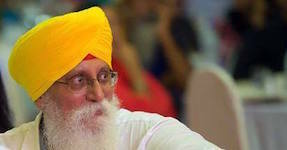 The so-called Sikh Calendar, presented to the Sikh world as Nanakshahi Calendar by learned fraternity of Chandigarh, known for creating controversies and backing the adversaries of Sikh Panth, Gurbaksh Singh Kala Afghana openly, backed Sardar Pal Singh Purewal, Government’s sponsored campaign to distort the Sikh history, and introduce a new Calendar in the sacred name of Guru Nanak. The Shiromani Gurdwara Parbandak Committee (SGPC) neither passed any resolution for replacing the existing Sikh Calendar nor entrusted the job to Pal Singh Purewal. Pal Singh Purewal Singh’s Jantri 500 Years was published by Punjab School Education Board in 1994 during the tenure of Chief Minister Beant Singh,whereas the Board is supposed to publish the text books for the school students with the quota of paper supplied to it. This was the first and last book, meant for researchers, published by the board. Here, I may add that when this very Jantri of Purewal was extensively quoted to question the wisdom of Mr Purewal, all the copies of this Jantri were exported to Canada. With this Jantri of Purewal, the Institute of Sikh Studies, Chandigarh, in its meeting dated November 27, 1995, prepared the Sikh Calendar within two hours, and presented to the SGPC through Dr Kharak Singh, member Dharm Parchar Committee of the SGPC to replace the traditional Sikh Calendar with distorted dates and history of the Sikhs in this so-called Nanakshahi Calendar. Before introduction of this distorted Calendar, a Sikh Calendar was/is used, and Nanakshahi Samvat was also used. This fact has been highlighted in 1993, long before the so-called Nanakshahi Calendar was introduced, in the Oxford Dictionary of World Religions (EdJohn Bowker): “The Sikhs’ religious Calendar is a modified form of the Bikrami Calendar.” (p 188). The first perfidy of Mr Purewal was exposed, who claimed that he is the architect of the Sikh Calendar. Secondly, the tall claim of Mr Purewal that he is the maker of Nanakshahi Calendar, which is original, was also exposed as it is nothing but a carbon copy of the National Calendar of India, introduced in March 1957 by Indian Government as a Civil Calendar, and is based on Saka Calendar, on which the Hindu Religious Calendar is also based. In the Nanakshahi Calendar and the National Calendar of India, five months are of 31 days and seven months are of 30 days. Whereas in Saka Hindu Calendar the month of Chet is of 31 days in during leap year and in Nanakshahi the month of Phagan is of 31 days. Mr Purewal has confirmed this fact in his book Jantri 500 Years,saying “The Saka year that starts in Common Era leap year will also be a leap year. The year will always begin on March 21 is a leap year. This way the months of the Saka Era will maintain constant relationship with those of CommonEra.” (p iv). In this way, Mr Purewal cleverly introduced the National Calendar of India, based on Saka Calendar (on which the Hindu Religion Calendar is based) as Nanakshahi Calendar. Interested readers may consult The Hindu Religious Year — by M.M. Underhill (1921). Thirdly, Mr Purewal spread the canard that Bikrami Calendar is a Hindu calendar and was introduced by a Hindu King of India Vikramaditya Bikrami Calendar had no connection with any Hindu king Vikramaditya, nor Vikramaditya is the name. This is mere a title which was assumed by eight monarchs of India. The first monarch so named was Chandraguptya II (376-414 AD)and this emperor was in constant war with the western India. It is accepted fact that Bikrami Calendar was introduced by the Malwa people of North-west Punjab in 57 BC, i.e., 433 years (57+376) before the first Vikramaditya title was assumed by Chandraguptya of Ujjain (Ancient Malwa and Vikramaditya Tradition by Dr D.C. Sircar, 1969). Thus, Bikrami Calendar was introduced in 57 BC on the land of five rivers in Punjab by a valiant community known as Malwa people, who were inhabitants of the valley of river Ravi. A section of these people migrated to Jaipur, Tonk region of Rajasthan, under pressure of foreign invasions. It was known as Malwa Samvat, which is evident from the historical records. “The era handed down by the Malwa republic” (Ancient Indian History & Culture http://www.kanpuruniversity.org/syllabus/ma.pdf Political History of Ancient India 325 H.C. – 319 AD. Rise of Mauryas- D.R. Bhandarkar, 1921 (Nos 5, 6, 9). Malwa people carried forward this Calendar to Rajasthan. Originally it started with the month of Katak. Hence, this Calendar is of East Iranian origin and is in use only in North-Western India. The Sikh Gurus accepted this Calendar and modified it according to Sikh ethics to make a Sikh Calendar in true sense, while in Hindu traditions it is known by the name ‘Vikarmi Samvat’ as Hindus normally use ‘V’ in place of ‘B’. In Sikh religious and historical literature it is known as Bikrami Samvat in accordance with the dialect used in Sri Guru Granth Sahib, Dasam Granth and related literature.